An economist by education, Nils S. Andersen started his career as a Controller with Nordic Sugar in 1982. He soon switched to the Carlsberg brewery group, where he held a number of market-focused positions before taking on responsibilities as CEO of breweries in Spain and Germany. As Executive Vice President and later CEO for the Carlsberg Group, Andersen led a number of acquisitions and market entries and headed a number of other group-wide initiatives that turned around the group’s financial performance and significantly strengthened its global position. 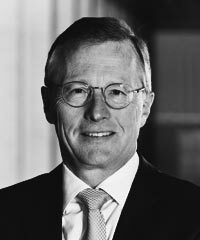 He also prepared Carlsberg for the acquisition of Scottish & Newcastle before becoming CEO of the Maersk Group in 2007. In his first few years as CEO, he spearheaded a transformation process that led to a more focused portfolio and leaner organization and strengthened the competitiveness of the group’s businesses. Under his leadership, the group has also increased its transparency and communication with stakeholders. Andersen’s first priority is the name of the group, and he is strongly engaged in the safety and motivation of employees.